Alexander Albon (born 23 March 1996 in London, England) is a Thai-British racing driver, currently driving in Formula One for Scuderia Toro Rosso. Albon started his career by racing karts at a very young age due to encouragement from his father, Nigel Albon. He enjoyed success in karting between 2006 and 2010 including titles at the 2006 Super 1 Honda National Championship (Cadet Class), 2009 Super 1 Honda National Championship (KF3 Class) and the 2010 European Championship (KF3 Class). After becoming part of the Red Bull Junior Team in 2012 he was promoted to open-wheel cars in the form of a seat with EPIC Racing during the Eurocup Formula Renault 2.0 2012 season, finishing 38th out of 49 in his debut year. He stayed in Formula Renault 2.0 for two more seasons having secured a seat with KTR, finishing 16th in 2013 and 3rd in 2014. In 2015 Albon switched to European Formula 3, finishing 7th overall. A year later, ART signed Albon to race alongside Charles Leclerc in the GP3 Series, finishing second in the drivers championship only to his teammate. Albon was given a seat once again by ART in 2017 to race in the FIA Formula 2 Championship where he finished his maiden year in 10th position. Albon was born at The Portland Hospital in London, England. His father, Nigel Albon is a former racing driver who participated in the British Touring Car Championship and Porsche Carrera Cup. His mother is a native of Thailand. Growing up, Albon spent time at Ipswich School in Ipswich, Suffolk, before leaving the school to pursue his professional racing career. Albon started competitively racing karts in 2005 at the age of 8, competing locally and winning his local Hoddesdon Championship. In 2006 Albon started racing in the cadet class, finishing 1st at the Kartmasters British Grand Prix and participating in the Super 1 National Honda Cadet Championship finishing 1st in 2006 and 2nd in 2007. In 2008 he moved up to the KF3 class where he stayed until 2010. During this time Albon won the Kartmasters British Grand Prix, Formula Kart Stars Championship, KF Winter Series, Super 1 National KF3 Championship, CIK-FIA World Cup and CIK-FIA European Championship. In 2011 Albon graduated to KF1 placing 2nd in the WSK Euro Series and 2nd at the CIK-FIA World Championship. From karting Albon graduated to the Formula Renault 2.0 Eurocup series where he drove for EPIC Racing in 2012 alongside Kevin Giovesi, Konstantin Tereschenko, Kevin Jörg, Dennis Wusthoff and Christof von Grunigen and finished 38th out of 49 in the championship after having a tough year and being unable to score points. In 2013 Albon joined KTR to race in the 2013 Eurocup Formula Renault 2.0 season alongside Yu Kanamaru and Ignazio D'Agosto finishing 16th out of 36 in the championship. Albon managed to secure one fastest lap and one pole position in the 2013 season, both of them coming at the Red Bull Ring in Austria. He finished the 2013 season with 22 points. In 2014 Albon raced alongside Gregor Ramsay, Jules Gounon and Callan O'Keefe and enjoyed a much more successful year. He was once again unable to find a win at any of the 14 races but managed to get one pole position at the Nürburgring and finished 3rd in the drivers championship with 117 points. In 2015, Albon switched to European Formula 3, racing at Signature with teammate Dorian Boccolacci. He finished seventh overall, with two pole positions (scored at the Norisring), 5 podiums (including four rookie wins) and 187 points overall. In December 2015, Albon partook in post season testing with ART Grand Prix. In 2016, Nyck de Vries confirmed Albon as racing in the 2016 season. ART signed Albon later that week and he claimed four wins and finished as runner up in the championship to teammate Charles Leclerc. In February 2017, Albon graduated to the FIA Formula 2 series, reuniting with ART. His teammate for the season would be Nobuharu Matsushita, who at the time was also signed as a development driver for McLaren. He made his debut at Bahrain, where he started in 9th place on the starting grid for the feature race and finished 6th. For the sprint race Albon qualified 3rd on the grid, behind Luca Ghiotto and his teammate, Matsushita. However, mechanical problems forced Matsushita to start from the pitlane. As a result, Albon shot into pole position on the lead up to T1, Albon did not close the door sufficiently and Ghiotto retook the lead on the brakes at the tight right hander. After struggling for grip for the majority of the race, Albon finished in 7th position. At the Circuit de Barcelona-Catalunya in Barcelona, Spain Albon placed 3rd on the provisional starting grid for the feature race. Leclerc led into turn one, but found himself under fire from Ghiotto and Albon after locking up. Leclerc began to pull away from Ghiotto, who began to fall into the clutches of Albon, who subsequently made a move into turn one and took second place from Ghiotto. Leclerc pitted on lap seven, along with Matsushita, leaving Albon with the lead of the race. Canamasas ground to a halt on lap 10 owing to problems with the car. Despite this, he did not pull off the track to retire – instead remaining on the track and gesturing to the marshals asking for a push-start. The dangerous position of the car initially brought out the virtual safety car and eventually, the safety car itself. As the race resumed, Leclerc and Ghiotto began to scythe through the pack. Rowland eventually pressured Albon into a mistake to take the lead of the race, although both still had an impending pitstop to make. With the fresh rubber, Albon and Rowland were staging a comeback with both drivers challenging for the podium toward the latter stages of the race, Albon later finished the race in 5th position. In the sprint race, Albon started 4th on the grid and enjoyed a well fought battle with Charles Leclerc for the majority of the race and after battling for a number of laps, Leclerc finally passed Albon for fifth place. Later in the race however Albon dropped back, finishing the race in 8th position. At the Monaco Grand Prix, Albon qualified second on the grid with a time of 1:19.321 seconds. In qualifying, the grid was separated into two Groups due to safety concerns over the short and tight nature of the circuit. Albon was part of the 'Group B' qualifying and managed to gain the fastest time in that group, only qualifying 12 hundredths of a second behind Charles Leclerc who qualified in Group A. After an aborted start due to Antonio Fuoco and Sean Gelael stalling on the grid, Charles Leclerc led into the first corner, followed by Albon. A concertina effect occurred at the Grand Hotel Hairpin as Canamasas was spun, causing Gelael to lose his front wing and bringing out a local yellow. Later in the race, Albon found himself stuck behind the slower moving Norman Nato and Jordan King, which eventually caused him to lose places, finishing the race in a disappointing 4th position. In the Sprint Race, Albon started 5th on the grid, and after a very tight race he dropped back to finish in 6th position. In the fourth round of the championship at Baku, Azerbaijan; it was announced that Albon would not be racing and instead was set to miss out for the race weekend due to injury. Albon sustained a broken collarbone whilst out on a mountain biking training ride, and was unable to compete due to the over-the-shoulder seat belts used in Formula 2. However, in an interview with motorsport.com he announced that he was hoping to be back for the next round of the championship at the Red Bull Ring in Austria. Albon was back in action for the fifth round of the championship, stating that his initial feeling on returning to action after breaking his collarbone was "a lot better" than he expected. He confirmed that the bone was still "clearly broken" following an x-ray on the Tuesday before the race weekend, and explained that the main issue he is having in the car is a "numb feeling" from the scar he received during successful surgery after the crash. Albon finished the practice session in 8th, which showed that despite the injury, the chance for his first podium in Formula 2 was a possibility. Albon qualified in 4th for the Feature Race, however was later promoted to third on the provisional starting grid after Sergio Sette Camara was disqualified after the qualifying session after failing to provide the required 1 litre fuel sample. Albon finished the Feature Race in 5th position, after losing places to Oliver Rowland and Nicholas Latifi (both racing for DAMS) whose car proved to have a lot of pace. For the Sprint Race, Albon started the race 4th on the grid and managed to move up the grid to clinch his first podium in Formula 2, placing on behind Artem Markelov. Albon was signed by Nissan e.dams alongside Sébastien Buemi as one of its drivers for the 2018–19 Formula E season, but he was released before the start of the season to instead drive in the 2019 Formula One season for Toro Rosso. His place was taken by former F2 colleague Oliver Rowland, who previously competed in the 2015 Punta del Este ePrix as an injury replacement for Mahindra Racing's Nick Heidfeld. On 26 November 2018, it was confirmed that Albon had been released from his Nissan e.dams Formula E contract after rumours he was to sign for Toro Rosso. On the same day, Toro Rosso announced Albon would join the team for 2019 alongside Daniil Kvyat and thus Albon's relationship with the Red Bull Junior Team was restored. He is the first Thai driver to compete in Formula One since Prince Bira competed in the 1954 season. At the 2019 Bahrain Grand Prix, the second race in Albon's Formula One career, he finished ninth to score his first points. In his third race in Formula 1, at the 2019 Chinese Grand Prix, Albon started from the Pit Lane having crashed in Free Practice 3 and being unable to compete in qualifying. Albon finished 10th and won the 2019 Chinese Grand Prix 'Driver Of The Day' award. † Driver did not finish the race, but was classified as he completed over 90% of the race distance. ^ "Alex Albon | Racing career profile | Driver Database". www.driverdb.com. Retrieved 22 January 2018. ^ "Introducing Alex Albon..." Red Bull. Retrieved 22 January 2018. ^ "Albon enters GP3 with ART". Motorsport.com. Retrieved 22 January 2018. ^ "Alexander Albon completes ART 2017 line up – Formula 2". www.fiaformula2.com. Retrieved 22 January 2018. ^ "Driver Standings – Formula 2". www.fiaformula2.com. Retrieved 22 January 2018. ^ "GP3 runner-up Albon confirmed for GP2 2017 promotion". 22 February 2017. Retrieved 22 February 2017. ^ Kalinauckas, Alex. 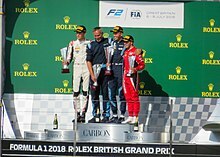 "Bahrain Formula 2: Ferrari junior Leclerc beats Ghiotto and Rowland". Autosport.com. Retrieved 22 January 2018. ^ Prix, ART Grand (19 June 2017). ". @sirotkin_sergey will replace @alex_albon in Baku due to an Alex' health issue. We wish you a quick recovery Alex #F2 : @FIA_F2pic.twitter.com/5e2DWxqLvU". @ARTGP. Retrieved 29 January 2018. ^ Kalinauckas, Alex. "ART F2 driver Alexander Albon explains injury behind Baku absence". Autosport.com. Retrieved 29 January 2018. ^ "Albon explains extent of cycling crash injuries". Motorsport.com. Retrieved 29 January 2018. ^ Kalinauckas, Alex. "F2 news: Injured Formula 2 racer Albon says return better than expected". AUTOSPORT.com. Retrieved 29 January 2018. ^ Kalinauckas, Alex. "Sergio Sette Camara loses Red Bull Ring Formula 2 front row start". Autosport.com. Retrieved 29 January 2018. ^ "Nissan signs Albon as Buemi's Formula E teammate". Motorsport.com. Retrieved 24 September 2018. ^ a b "Albon to partner Kvyat at Toro Rosso in 2019". formula1.com. 26 November 2018. Retrieved 11 March 2019. ^ "Driver Of The Day: Albon dedicates China point to mechanics after FP3 smash". Formula One. Retrieved 14 April 2019. Wikimedia Commons has media related to Alexander Albon. This page was last edited on 21 April 2019, at 10:14 (UTC).